Saturday morning May 12 saw many of the Porsche faithful return after their previous weekend’s RGruppe Treffen event in Solvang, California. The discussions that morning focused on personal accounts from the previous weekends activities, along with a rumor that one of the rare, standout cars from Solvang would be attending Cars&Coffee on this particular morning. And as if on cue, a Mexico blue Porsche 993 was seen entering the driveway into the parking lot, aimed towards Porsche row. Once parked, the view from behind revealed this 993s true identity. This particular car is not only an example of the rare, european only Carrera RS models, but also has the distinction of being one of the limited production, highly desirable performance variants – a 1996 Carrera RS Club Sport. 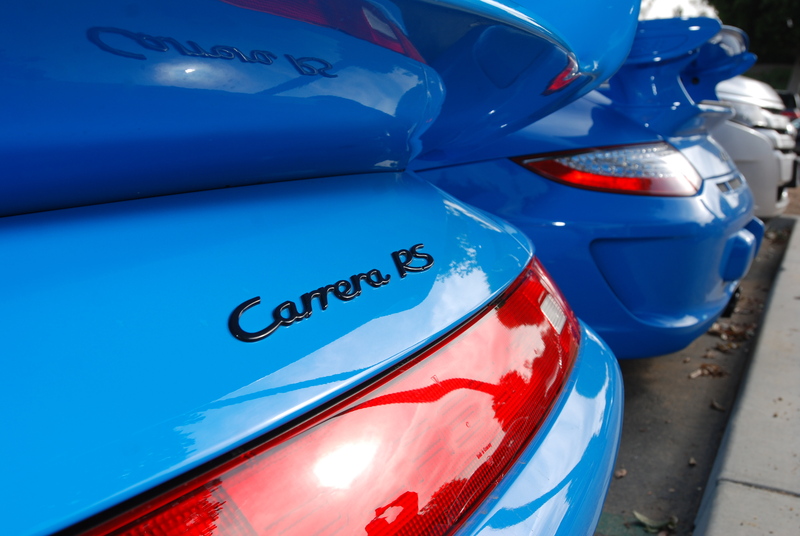 For 1995, Porsche produced a total of 1130 Carrera RS models, followed in 1996 by a final batch of only 57 RS models, making this particular car by virtue of its build date one of the last type 993 RS models produced. 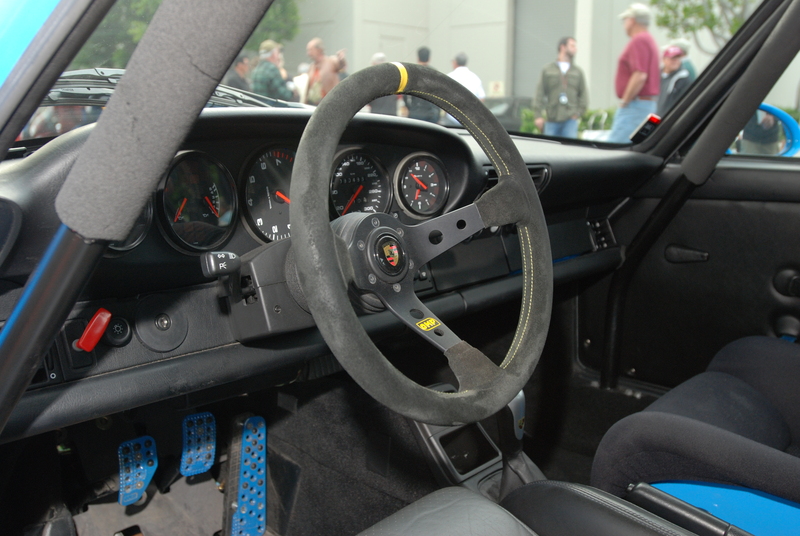 And from the total number of Carrera RS models that Porsche produced, only 47 examples were constructed to accommodate the right hand drive (RHD) marketplace. 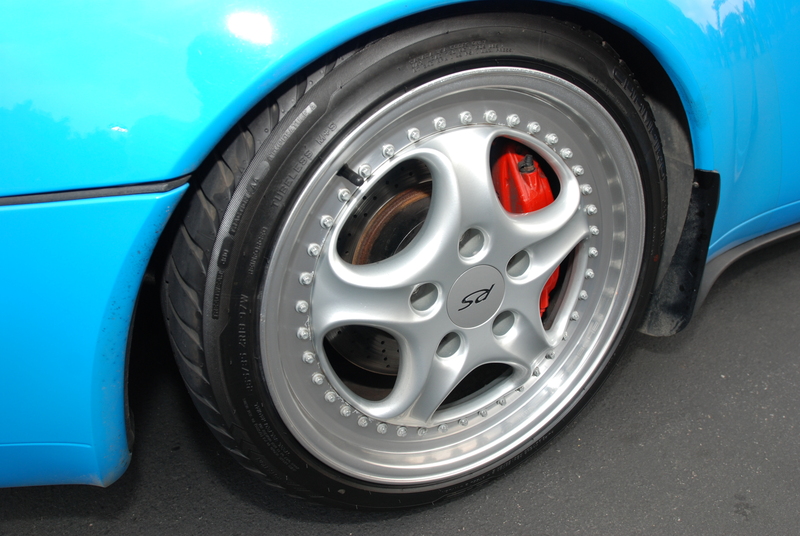 Three visual cues can be used to differentiate and identify a Club Sport variant from its base Carrera RS sibling. The first and most obvious is the large dual plane, adjustable angle rear wing and with added cooling and induction intakes, instead of the flat profiled, whale tail spoiler found on the base Carrera RS. 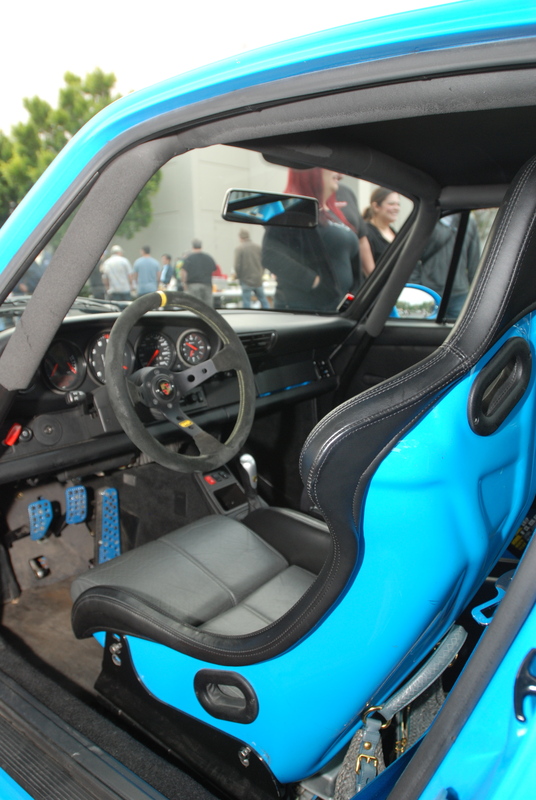 The two remaining cues are both found within the car: the pair of lightweight sport seats ( reported to save 66 pounds each over a stock seat), and an installed welded in roll cage, instead of a bolted together cage. Another unique, yet less obvious performance component fitted to the Carrera RS Club Sport model is the front hood. 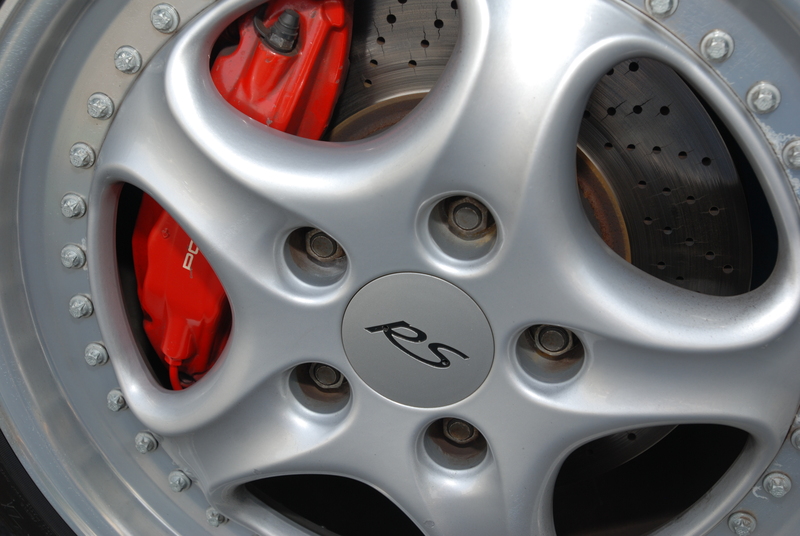 For this model, Porsches weight savings efforts focused on material options, and as a result manufactured all of the RS Club Sport front hoods from aluminum. This demonstrates a classic example of Porsches attention to detail; studying the cumulative effect of component weight reduction for an increase in vehicle performance. The photo above and those following provide a glimpse of the design evolution that occurred between 1996 and 2011, as witnessed by the recent performance offering; the 2011 Porsche 997 GT3 parked beside the Carrera RS Club Sport. 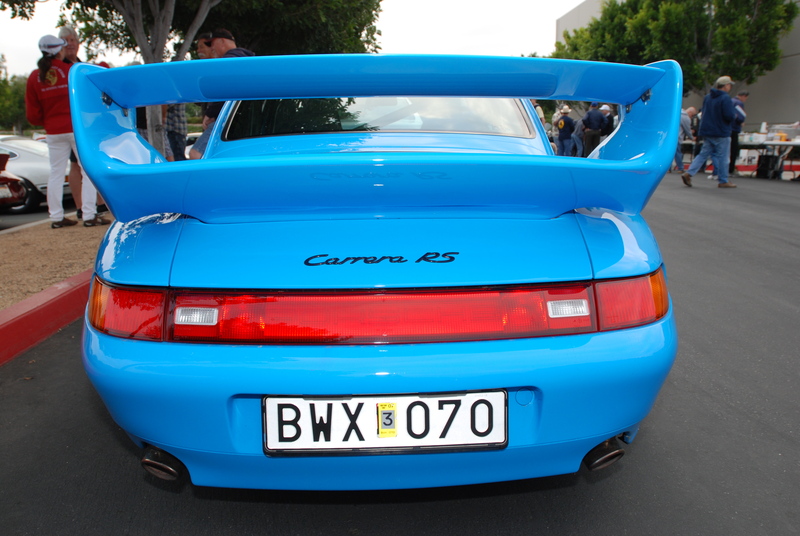 It was also interesting to observe one of Porsches latest color offerings, especially this interpretation of blue. 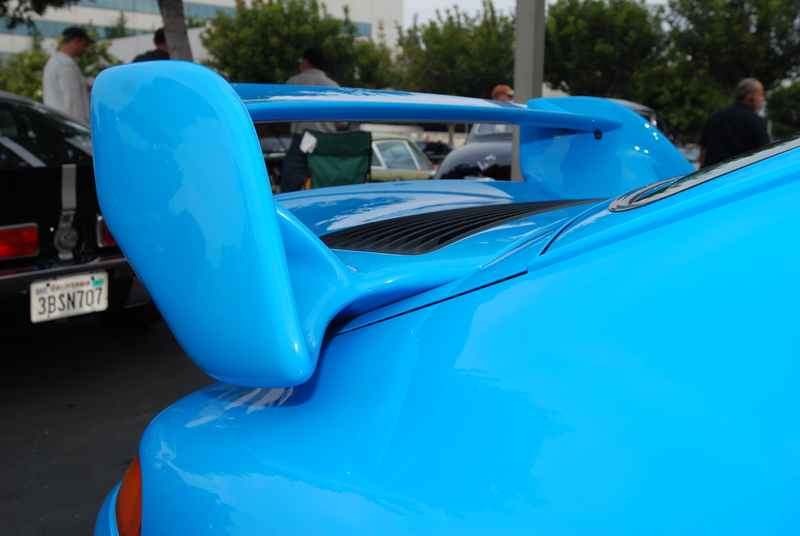 Case in point, the 2011 Type 997 GT3 dressed in Porsches Riviera blue. Each of these cars when viewed by themselves appeared to be very similar in color to the other. However when parked side by side, their subtle color differences became much more apparent. Residing beneath the Carrera RS Club Sports rear wing is Porsches purpose-built, 3.8 liter motor, tuned to deliver 300 horsepower. This potential translates into 0-60 times of 4.7 seconds, with the capability of producing a terminal velocity of 174 MPH. Parked side by side, these two Porsches provided the casual observer an opportunity to view the design changes that have occurred over the past 16 years, not only to the overall styling, but to Porsches revised approach towards aerodynamics. 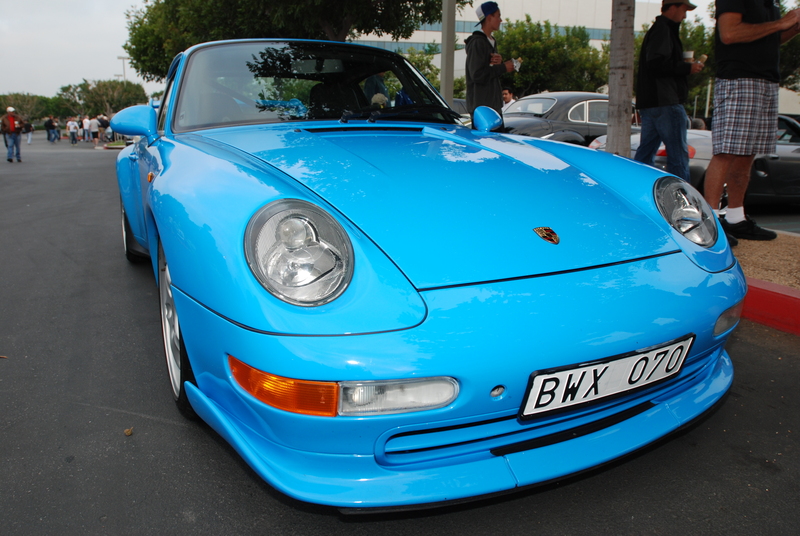 This entry was posted in 1996 Porsche 993 Carrera RS club sport, car shows / special events, Cars&Coffee / Irvine, Porsche and tagged Automobiles, Cars, cars&coffee/Irvine, Porsche, Porsche 993 Carrera RS club sport by digitaldtour. Bookmark the permalink. So glad I subscribed to this after your Reddit post. It made my morning reading this after a little email found its way to my inbox. Keep on! Thank you for your comments, and I’m glad that you enjoyed my recent post. 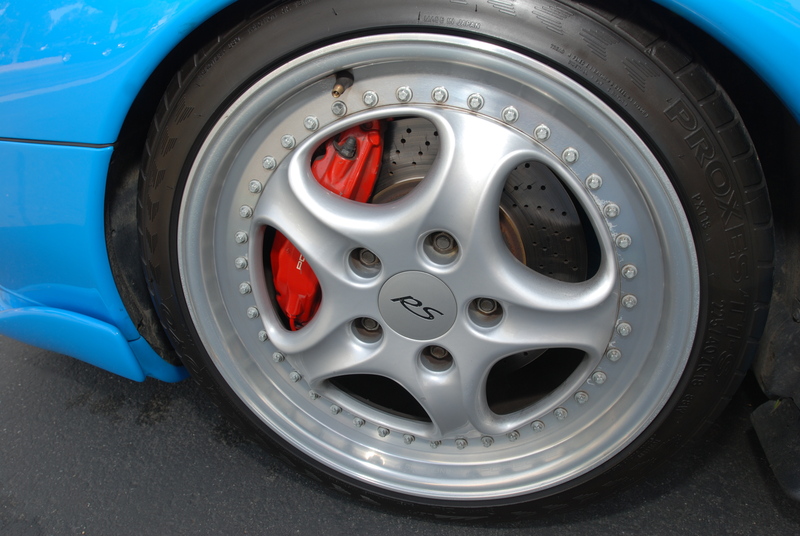 I only had a cursory knowledge of the 993 Carrera RS and I knew nothing of the Club Sport. Thanks for the information and lovely photos. Thank you, I’m glad that you enjoyed my latest post. The Carrera RS Club Sport is one amazing car. Love the pics, Chris. Thanks for sharing these with all of us! The RS Club Sport is amazing! Not a bad example to have as ones first sighting of a true 993 Carrera RS Club Sport. Hope to see you at C&C on Saturday, if the weather cooperates. Thanks for providing that information on the Club Sport that I previously didn’t know. Great pictures two, especially the contrast of the current GT3 and the RS Club Sport. I appreciate your feedback, and am glad that you enjoyed my recent post.